Steven Pash, a native Canadian of the Cree population in northern Canada, is walking down the front steps of the Canadian Parliament with a big smile on his face. He has just witnessed the apology by the Canadian government for the former policy of Indian residential schools, from the public gallery in the House of Commons. He feels relieved, he says. As a six-year-old boy, Pash was taken away from his parents in northern Quebec, and sent to a boarding school for Indian children, first in Quebec, later in Ontario. The purpose of the roughly 130 residential schools, which operated between about 1850 and 1970, was to assimilate Indian children into white society. About 150,000 children attended the schools. Pash was picked up by bush plane; his parents, who lived off the land, could not do anything about it. But it wasn’t normal at all, the Canadian government has since recognized. It ran most of the schools in cooperation with churches. Ten years ago, a ‘statement of regret’ was offered. That was considered insufficient. Yesterday, a full apology was given during an elaborate ceremony in the House of Commons: apologies for the loss of culture and identity of the students, for breaking their family ties, for physical, psychological and sexual abuse, for neglect and for the death of an unknown number of Indian children — and for the very purpose of the policy. 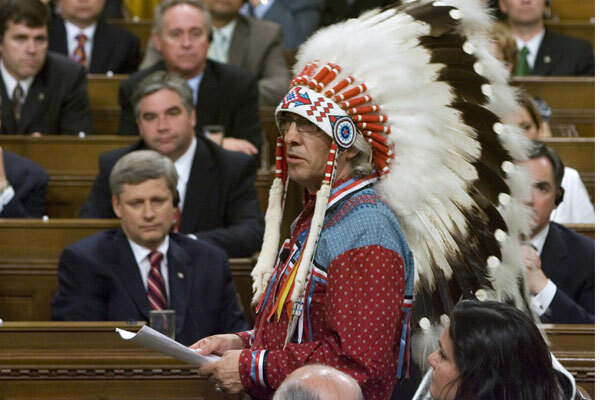 Phil Fontaine, national chief of the Assembly of First Nations, gave a unique address in Parliament, where normally only members are allowed to speak. He spoke of “a new dawn in relations between us and the rest of Canada”. The historic apologies follow those offered in February by the government of Australia to its Aboriginal people for residential schools (an estimated 100,000 children were sent to those institutions). In Canada, the apologies are linked to a compensation settlement: in total, nearly $3b has been set aside for indemnity payments to all former students who are still alive. Pash has received $40,000, he says. Also, a Truth and Reconciliation Commission has been established to record experiences of former students and facilitate atonement. But there is criticism as well. Margaret Sutherland of the Cree population of northern Ontario hopes that Harper will match his words with actions to improve the lives of native people in Canada, who often live in poverty on reserves. She points out that his government has rejected an accord for billions of dollars of investments into health and education for native people, reached by Harper’s predecessor, Paul Martin.